Years ago, in times when my wife and I could travel freely throughout the world without worries, we spent a week or so visiting some dear friends in Astoria, Queens. Astoria is a great example of New York's incredible diversity, and has always been known as its Greek Oasis. Needless to say, Greek restaurants abounded in Astoria, but there was one in particular that my wife and I stopped in over and over again during that trip. We would pass by it walking home from the train and on some nights we would stop in for a nightcap of some perfectly executed Greek delicacy--not because we were hungry, but just because it was that good. At the time it made me realize how much I missed well-prepared, fresh Greek food and it made me a little sad to think that back in Denver were mostly diner-style Greek options--some good Gyros--but nothing truly great. So it was with great anticipation that I awaited a meal at Denver's newest Greek option, Axios Estiatorio, after making plans to eat there with Denveater and the infamous Mantonat--along with all our significant others. What follows is a part one of a two-part post of our three takes on a fun night at Axios. For part two, visit Denveater's blog. Ready, set, go! Mantonat: I haven't eaten calamari in a restaurant in ages, mostly because of the lack of variety and originality in the presentation: flavorless, chewy deep-fried rings with a dipping sauce just have limited appeal. These were delicious though; tender and tasting of the ocean and covered in a beautifully complex broth rather than a layer of oily breading. 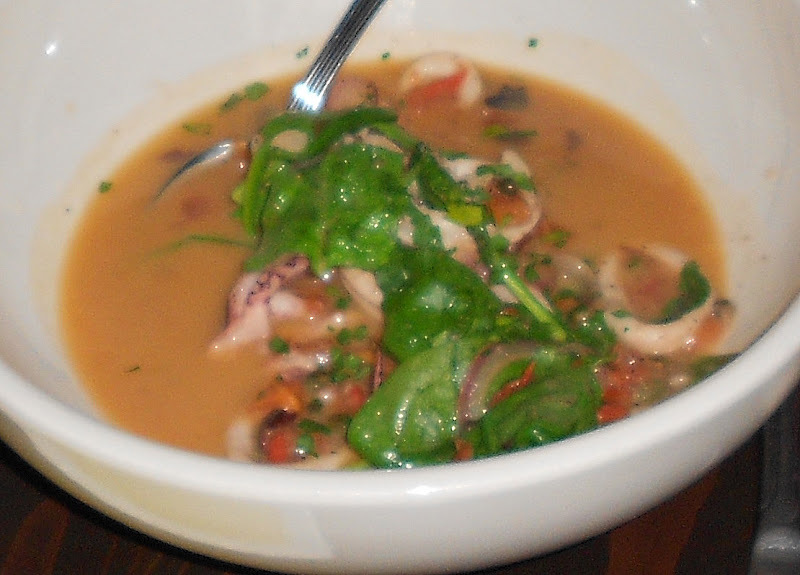 Denveater: I could've slurped down that broth even without the squid; containing both white wine and sherry, olives and capers, garlic and onions (as well as tomatoes and spinach), it had unusual vibrancy depth of flavor. DOAS: My wife loves calamari almost as much as she loves pickled pig’s feet (I'm happy to say that I make her top five most days, depending on her mood). I wasn't all that excited to see it drenched in so much broth, but although it was too salty in my opinion, it did have a nice, rich flavor, and the calamari was well cooked. 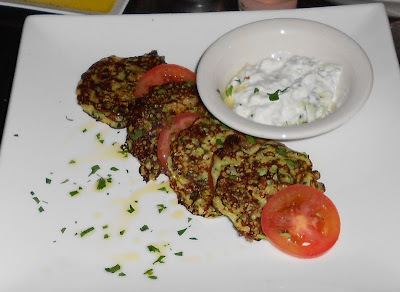 Denveater: From the description, "zucchini and feta fritters," I expected pungent little breaded and deep-fried orbs, not light, tender mini-latke-like objects that were all about their vegetal flavor, enhanced by tzatziki that was especially chunky with cucumber. In short, what I thought would be guilty pleasures turned out to be borderline healthful, which actually made them that much more pleasurable. Mantonat: Yes, this was another dish I expected to be deep-fried. Instead, they were delicate pancakes with a tangy yogurt sauce. A nice appetizer with a starting beer—but I wish restaurants would just skip the pale winter tomatoes. DOAS As you both commented, this was a pleasant surprise for not being a deep-fried greasy patty—although when I write that, I think to myself: "A deep-fried patty dripping with oil sounds pretty damn good." I agree that they were fresh and light—borderline healthy with all that vegetable flavor. DOAS: This was my favorite. Dolmades of any kind are one of my many food loves. There is something about those slimy, slippery green leaves that I can't get enough of. These were the two biggest dolmades that I have ever eaten, which is something noteworthy in my personal stuffed-grape-leaf-eating life, but they were also excellent—both on their own and with the creamy, velvety lemon sauce. Denveater: Agreed—a distinctive, elegant variation on the traditional version, thanks both to the wine-steeped and pinenut-studded rice filling and that rich splash of lemon cream. DOAS: I don't say this too often about lamb dishes, but I didn't like this plate very much at all. The tomato sauce was way too much for me and overall it just wasn't, well, all that good. 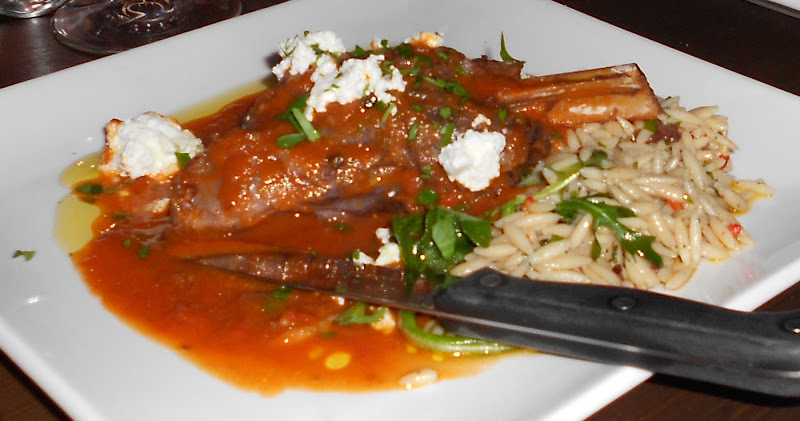 It was too bad as the orzo was nice, the lamb was falling off the bone and luscious, but that sauce literally drowned it all out. Denveater: I only tasted the orzo in roasted tomato sauce enriched with lamb drippings, and for me it was just right—robust, tangy, nutty from the grain. The Director sided with you completely, however. So there you have it, half of our meal from Axios. I must say that I had some wildly high hopes for Axios, and while it wasn't a perfect meal for me, it was still very good and the service was excellent, the atmosphere welcoming and there was Greek wine aplenty. For more on all that, read part two of this post on Denveater's blog. It was a pleasure joining you, your wife, and Denveater for some good food and great company! I noticed that those dolmades made Westword's list of top 100 dishes.